When Leah Penniman posted on Facebook about an upcoming one-week Black and Latino immersion program on her upstate New York farm, it filled up in 24 hours. The program at Soul Fire Farm is designed for young people of color, “to ease them back into relationship with the land,” says Penniman. 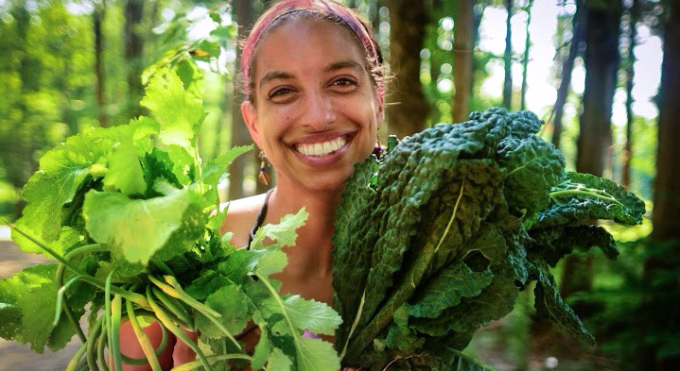 This farmer/educator’s life is rooted in a commitment to fighting racism and dismantling what she calls “oppressive structures that misguide our food system.” Penniman wants everyone—regardless of class, color or creed—to have access to fresh, healthful food and an understanding of how to grow their own. Now in its second year, the immersion program brings young aspiring growers and novice farmers from nearby New York City and Boston, as well as further afield, to learn basic sustainable farming practices and whole food preparations. Topics range from soil chemistry to how racism has impacted people of color’s relationship with the land. A seasoned high school science teacher, Penniman runs Soul Fire Farm with her husband Jonah Vitale-Wolff. The 72-acre property, raises more than 80 varieties of vegetables and around 20 types of fruits, as well as laying hens and meat chickens. It is also certified naturally grown, an alternative to certified organic. The couple, who met in college and have two children, purchased the land in December 2006 and began farming part of it in 2010. The family deliberately chose Grafton, a small town with a population of around 2,000, 20 miles east of Albany near the Massachusetts border. It is rural but not isolated. They wanted a steady stream of visitors from neighboring cities and the ability to deliver to urban dwellers. But the rural life is not without its challenges, especially in an area with limited agriculture, poor soil, and steep slopes. Soul Fire operates a sliding scale CSA; diversity in produce is as important as accessibility for people regardless of income. During the growing season, fruits and vegetables are distributed to around 55 families in low-income urban enclaves in Albany and Troy. In 2015 the farm share will take a break to honor the Jewish agricultural Sabbath known as Shmita. The farm accepts federal government programs intended to help poor people pay for food, such as SNAP and EBT. Farming found Penniman accidentally. Raised by her father in rural Massachusetts, she developed a deep connection with the forests, rocks and water. But it wasn’t until she spent time with her Haitian-American mother in Boston, where she landed a summer job as a farm program participant with The Food Project, that she got a feel for what it’s like working in the dirt. The program, she says, did a great job integrating a “hands-on the land” philosophy, while feeding people in need and developing social change leaders in the community. At the Monterey Bay Aquarium’s Sustainable Food Institute earlier this year, Penniman spoke on a panel with a new generation of farmers. There she addressed the need for intergenerational support among farmers of color. At her core, Penniman is always a teacher. In early 2015, the 34-year-old Fulbright scholar, who has taught in Haiti, will head to Oaxaca and Chiapas, Mexico with her family to teach, of course, but also to learn about local farming practices. She plans to write a class curriculum in Spanish and English intended to integrate sustainable food practices into math and science lessons. Photos by Capers Rumph. From top: Leah Penniman, participants in Soul Fire Farm’s Black and Latino Immersion Program. This is a great project indeed. I have only one objection. It should not be limited to a certain race, because then we fall to the same minority - majority dichotomy that was well depicted in the comedy Closing Escrow. There are young people of other races as well. I believe in a mixed participation. Learning from each other. Otherwise, this project shows great community effort. I hope it will continue to inspire similar projects in the future.